The Oculus Rift virtual reality headset has generated a lot of excitement ever since it’s Kickstarter campaign back in 2012. And while the feedback, so far, has been amazing—there are a few aspects that still need to be figured out in order to achieve a total VR experience. One of the challenges when playing a first-person (FPS) shooter game, is having the character’s gun locked into one position, regardless of how you move your head. Well, developer Chris Gallizzi, who earlier this year developed a mod for Oculus Rift support with Elder Scrolls Online, may have come up with a solution for FPS. Working with Hyperkin, Gallizzi has developed a prototype motion-sensing gun peripheral that works together with the Oculus Rift virtual reality headset to achieve a much more realistic, and immersive experience for player. The 3D printed prototype mod, which Gallizzi refers to as the “Alpha Gun”, sends data via Bluetooth and allows the movement to be tracked independently of the players head. When playing a FPS game in virtual reality, its these little details and sense of freedom that allow the player to truly immerse themselves into the virtual world. A video uploaded by Gallizzi on his YouTube channel shows the “Alpha Gun” in its early stages of development being showcased at a local Play N’ Trade store in Los Angeles, California. 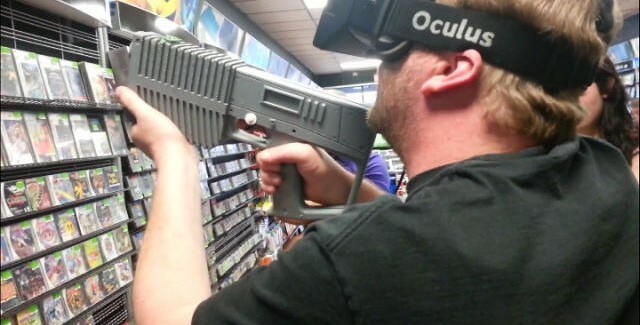 While the Oculus Rift gun peripheral is still a work in progress, the team hopes to release a finished product by the time the consumer version of the Oculus Rift is made available to the public.